Whenever traveling to Cambodia, temple immediately is the thing that people think about first. Angkor Wat is one of the most famous temples because of its splendid architecture and sophisticated bas-reliefs. Every year, millions of people head to Angkor Wat in Siem Reap to admire this amazing Khmer architecture as well as one of the Seven Wonders in the world. According to the Khmer language, “Angkor” means the capital, while “Wat” means temple or pagoda. Angkor Wat is the largest Hindu temple over the world with an area of 200 hectares. Angkor Wat faces with the west, different from others facing the east. Therefore, many tourists head to Angkor Wat in the afternoon to watch the spectacular sunset. The colors are extremely intense but do not just pay attention to the sky, notice to the lake too, the reflection of the temple and the clouds are stunning. Tourists often choose to watch the sunset at Phnom Bakheng or the Terrace of Srah Srang, where you can see the sun over the forest. Actually, we think that from any temple you will have a stunning view. Angkor Wat was built under King Surja-Warman II (1113-1150) and is now nearly 1000 years old. As the King was a Hindu believer, the architecture of Angkor Wat also influenced intensively by the worldview of Hinduism. According to Hindu’s belief, the four surrounding ponds are representatives of the four oceans covered the earth. Five towers of Angkor Wat were all built by countless green stones, representing for the five mountains in India. The tallest tower is Mount Meru, which is known as the home of gods. The stair leads to the top used to be quite narrow, steep, almost 45 degrees. However, there have wooden stairs with handrails for visitors here recently. Tourists come to Angkor Wat from the west by getting along the road and the stone corridor. The corridor is just 3m wide but very long. Once walking in the temple, you will be impressed by thousands of bas-reliefs on the walls, roofs, etc. 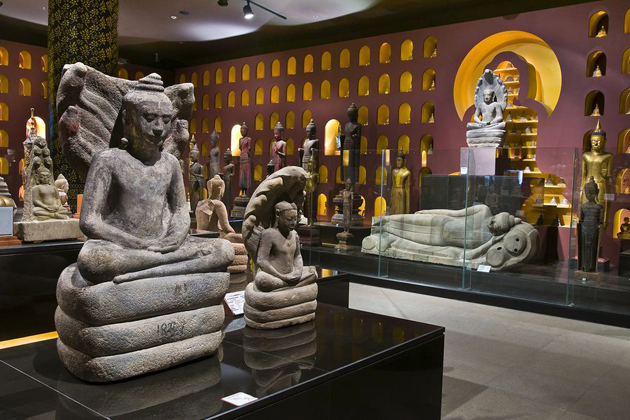 These bas-reliefs describe the daily life of Khmer ancient people and Apsara bayaderes. There exist more than 2,000 Apsara bayaderes and each Apsara is one-of-a-kind. The entire complex resembles the cosmos according to the Hindu belief and acts as one big mandala. Legend has it that the mythical Mount Meru is the axis of the universe and home of the Gods, which in the Angkor Temple Complex is represented by the five towers located in the center. The design of Angkor Wat is like a symmetrical mandala with many correspondences in numbers and shapes. For example, there is a total of 108 lotus-shaped towers and over 2000 divine nymph figures (called Apsaras) carved on the walls and towers, all are impressive and carry a sacred meaning. Apart from carvings of the nymph, you can also find intricate bas-reliefs that describe mythical battles, 32 hells, and 37 heavens according to the Hindu belief. It seems like almost every ancient masterpiece somehow holds a dark history, Angkor Wat is not an exception. King Suryavarman II, who started the construction of the Angkor Wat, found himself among the list of usurpers after he murdered his own uncle at the age of 14 to overtake the throne. The king, in an attempt to prove himself to the people, planned a massive and intricate temple that would serve as his gateway to the afterlife. Thousands of Khmer were forced into harsh conditions during labor to build this “heaven on earth”. The cost of construction was also staggering as more than five million tons of sandstone was quarried and transported a long distance to serve the building of the temple complex. Located in the center of Cambodia and hidden in the large, thick jungles that cover the area, Angkor Wat was completely isolated from the Western World until the French colonialists discovered it in the mid-19th century. The French first heard rumors from the locals about “temples built by gods or giants”. Later on, while having a zoological expedition, French naturalist Henri Mouhot stumbled across the city complex of Angkor Wat and presented this impressive structure to the world. The temple complex was left incomplete after the death of King Suryavarman II, but that doesn’t make it less impressive. A peculiarity about Angkor Wat itself is that the Angkor Wat is oriented to the West, unlike most of the other Angkorian temples that face east. All wall carving was covered with gold leaves. Up until today, you can still see some gold flecks if you look close enough. Recently, about 1796 devote carvings have been restored to look close to its most glorious time. It was believed that after the death of King Suryavarman II, he would be transmuted into Vishnu, “The Preserver”, to whom Angkor Wat is consecrated. The earthly god Vishnu, the origin of the temple, as described in the world’s oldest religious text – Rig Veda. The design of Angkor Wat shows the inseparable relationship between Astronomy and Hindu cosmology. Along the four walls of Angkor Wat are mythical scenes that seem to link with four seasons. In the east wall is a scene illustrating the “churning of the sea of milk,” a myth in which the gods attempt to churn the elixir of immortality out of the milk of time, a scene representing the renewal of spring. The scene in the north wall depicts the “day of the gods,” representing the summer. Along the west wall is a great battle scene from the Mahabharata, representing the decline of autumn. Lastly, the south wall portrays the kingdom of Yama, the god of death, a sign of winter. There are three types of ticket you can choose. We recommend you should buy ticket from official ticket booth rather than buy from unauthorized people. Don’t be fool to buy a taxi driver or hotel receptionist said that they will offer a better deal. Angkor Wat is opened from 5 am – 6 pm every day. You should always keep the ticket in case the security will check. For the Angkor Wat sunrise trip, you must be at the temple around 5:00 am. You should show up soon to find out the best place to ensure for watching the sunset, therefore don’t be lazy or late. For the sunset, it happens between 5:15 am and 6 pm. From November to March is the ideal period of time to visit Angkor Wat, when there is no rain and dry weather. The rainy season starts from June to September. 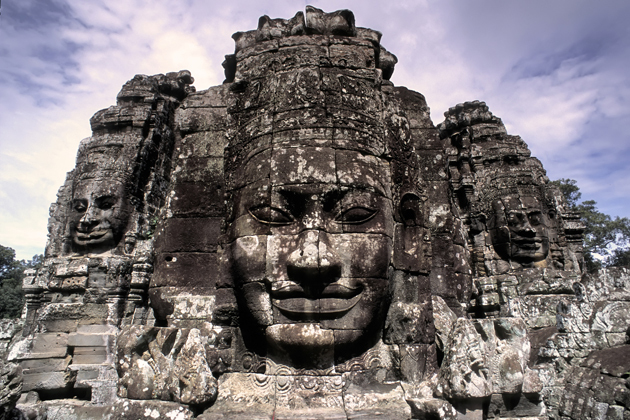 To be honest, Angkor Wat is a must-come attraction, so its attract tourists all year round. Each season Angkor Wat has its own unique beauties, even in the rainy season. • As we have mentioned, don’t buy Angkor Wat tickets or tours from unreliable sources. • The temple is situated in the middle of nature, so be armed with mosquito repellent, sunscreen, hat. On the way to Angkor Wat, there are plenty of small stalls selling drinks, so you don’t have to carry the heavy bottle of water all the time. • Importantly, Angkor Wat is not just an archeological site, it is a temple, so make sure that you cover your shoulder, dress formally and avoid clothes like miniskirts, shorts, etc.